I was reading, some time back, through back copies of Chepstow Weekly Advertiser I had, and noted that W.H. Greene had published a couple of his poems – Checking this out in my copy of ‘Folklore and Dialect of The lower Wye Valley‘ by Ivor Waters, a Moss Rose Publication of 1982, I noted the story on pages 72-74. This is the story of a stone throwing competition between those old rivals Jack O’ Kent & The Devil, said to have taken place at Tidenham Chase and resulting in the Devil’s throw placing a standing stone, which menhir can be seen to this day rising some 9 feet in a field adjoining the old GWR line, still used, from Chepstow to Gloucester. 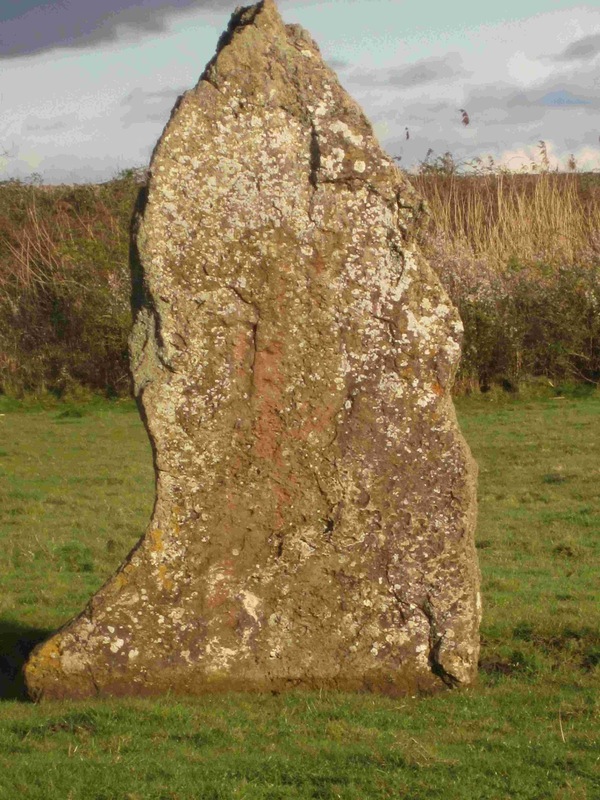 The stone stands in Stroat on the landward side some 50 feet from the railway line is rather unimaginatively known as The Wibdon Broad Stone though formerly it may well have been known as The Devil’s Quoit to judge by William Henry Greene’s poem. It is strange that it has attracted the name Wibdon Broad Stone as it very clearly stands in Stroat on the land of Stroat Farm and at 50 inches in width it can hardly be considered ‘broad’ – It is thus more reasonable to call it The Stroat Standing Stone’ or perhaps ‘The Dolmen of Stroat’ or perhaps ‘The Stroat Menhir’! It is said that with a smaller stone Jack O’ Kent (might that be a popularisation to Kent of the title ‘Gwent’?) was thrown somewhat further landing near Thornbury on the South Bank of the River Severn. You can read more of W.H. Greene born in Ross on Wye in 1832 who lived for some time in Chepstow and worked as a newspaper reporter for various titles in Monmouthshire – a profession his son followed in having been a reporter for The Chepstow Weekly Advertiser – W.H. Greene died in Newport on 31-Mar-1893. When the weather improves I will try to remember to get some photos of The Stone and may also be able to track down The Thornbury stone via my cousin who has lived and worked in the Thornbury area all his life. I have spoken with my cousin and he is trying to identify Jack O’ Kent’s stone near Thornbury. 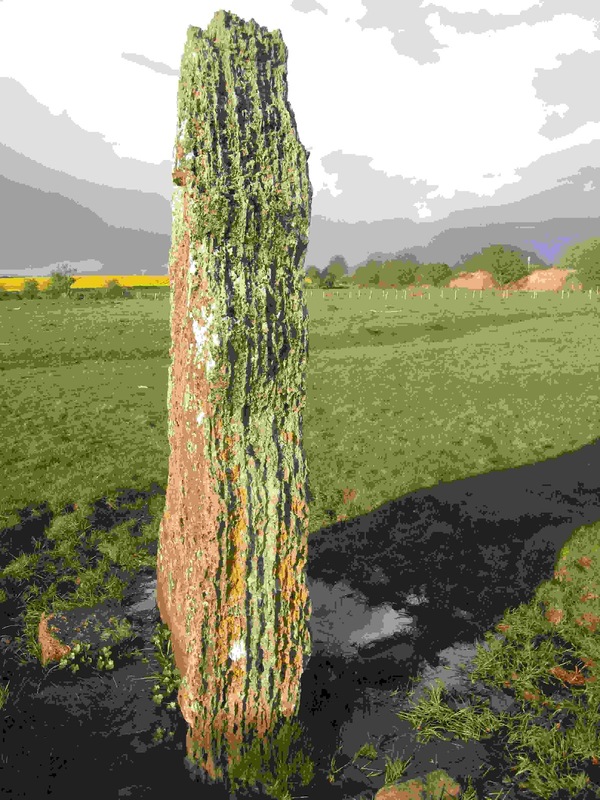 I on the other hand set out to find The Stroat Standing Stone which I eventually found, almost directly between our house and The Severn standing isolated in a field, in fact nearer 50 yards than 50 feet from the rail line. The Menhir stands some 97 inches high from the ground level to its tip. Though wider at the base the widest point higher up is about 50 inches. This heavily statified menhir is 14 inches thick. 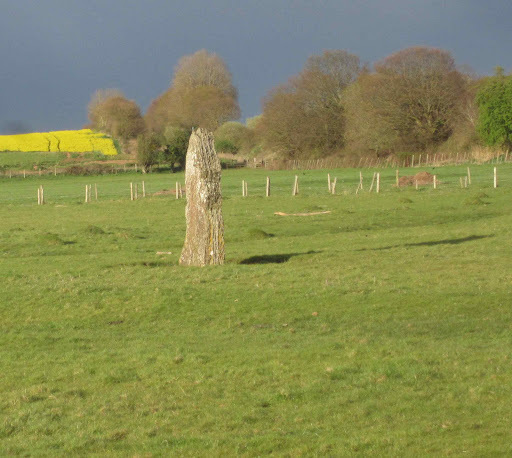 There is no indication of how deeply set the standing stone is set in the soil. IF YOU HAVE any information, stories or anecdotes of Stroat and its immediate environs please share them – do contact me and I will add them to the internet record – whether attributed or not is YOUR choice.